Mosque open day—a missed opportunity? The inaugural National Mosque Open Day occurred on Saturday 25 October, launched by the Lebanese Muslim Association and supported by the Department of Social Services. It coincided with the National Day of Unity declared by Jewish, Christian and Muslim leaders , inviting Australians to engage in acts of harmony and unity. This is part of a broader Australian national security strategy. With an estimated 60 Australians currently involved in active combat with Islamic State and increasing concerns about extremists here, the Abbott government announced a $630 million counterterrorism package in August. In addition to hard power measures, such as specialised teams at airports and the recently-passed Counter-Terrorism Legislation Amendment (Foreign Fighters) Bill 2014, $64 million of this package will be dedicated to measures to counter violent extremism and radicalisation in Australia . 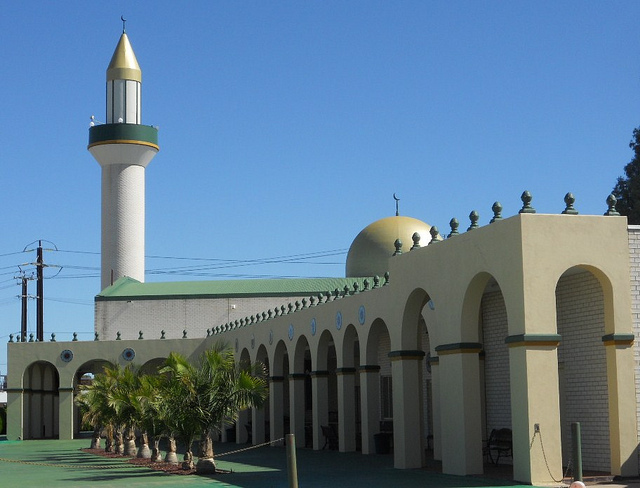 While mosques and Islamic centres have had open days previously, this is the first time that nine mosques in seven Australian states and territories have simultaneously opened their doors to the wider community. It’s a pity that the general public here in Canberra don’t seem to have embraced the initiative in greater numbers. The event comes at a time of considerable media attention towards the Australian Muslim community’s response to the raising of the terror alert level and the issue of Australian foreign fighters in Iraq and Syria. Unfortunately, the most radical voices also seem to be the loudest, regardless of the fact that they don’t represent the majority view. One example is Wassim Doureihi of Hizb ut-Tahrir’s now infamous interview with the ABC , which failed to add a moderate Muslim voice to the national dialogue. At the other next of the spectrum, moderate leaders such as Dr Jamal Rifi have received criticism and death threats for condemning violence and calling for calm —hardly an incentive for moderate Muslims to speak out against violent extremism. The open day featured tours of the facilities, a traditional lunch and children’s activities, echoing school fairs occurring around the country on any weekend—with a Q&A session thrown in. In the session I attended, Imams took questions from Muslims and non-Muslims alike, discussing the similarities and differences between Shiite and Sunni Islam and between the Abrahamic religions of Judaism, Christianity and Islam, as well as the meaning of jihad and misconceptions of Muslims in the media. The community at the Canberra Islamic Centre embraced the spirit of the day, welcoming visitors, starting conversations and offering tours of the facilities. A young woman named Rabaiya introduced herself to my friend and I, commenting on the role of women in Islam, whilst a conversation with Ahmed in the library underlined the importance of education and community to Muslims. And this, remember, at a centre that was vandalised twice within a fortnight in April 2014. While only a handful of people are believed to have been involved in the vandalism, the recovery was facilitated by the wider Canberra community including ambassadors from 18 countries . Those assisting far outnumbered those creating the damage, a point not lost on the community. But Centre president Azra Khan acknowledged increased awareness and community support was required . The event was well attended in Sydney and Melbourne. Minister for Immigration & Border Protection Scott Morrison visited the mosque in Lakemba and expressed support for the initiative as well as concern for Bankstown teenager Abdullah Emir , who’s believed to have joined IS forces in Syria. Prominent Muslim commentator and academic Waleed Aly conducted a live broadcast with Raf Epstein on ABC radio  from the Virgin Mary mosque in Werribee. Social media revealed large groups of the wider community  gathering to participate in tours and listen to community leaders. Notable visitors to the Canberra Islamic Centre included US Ambassador John Berry and Catholic Archbishop Christopher Prowse. Whilst the community was welcoming and enthusiastic in receiving new visitors, the numbers of visitors were few compared to the hosts. In a city full of professionals dedicated to law enforcement, national security and community resilience, one might have expected more attendees willing to visit, ask questions and engage with a community struggling to have its many moderate voices heard. Community engagement is a two-way street, and involves much more than those from a targeted community opening their doors and being willing to converse, educate and dispel misconceptions. There’s an equal responsibility on the rest of the community to listen and respond, ensuring that such efforts achieve their goals of educating the public and strengthening community resilience. One might ask about the role of government in promoting such events. Whilst the open day was advertised on Living Safe Together—an Australian government initiative aiming to building community resilience to violent extremism—it’s likely that such a resource is mainly reaching those who are already part of the community-engagement strategy. Instead, policy makers need to work out how their message can reach those who aren’t currently familiar with moderate Islam, and would benefit the most from engagement. It’s impossible to force the wider population to engage in these activities, and undesirable to try. The challenge is to entice the wider populace to engage with the Islamic community and to make this an attractive aspect of Australian civic life. Clare Murphy is an intern working within ASPI’s Strategic Policing and Law Enforcement Program. Image courtesy of Flickr user Michael Coghlan .